Elegance with a view can be yours at the Terrace Room located in the Hopkins Park Community Center. 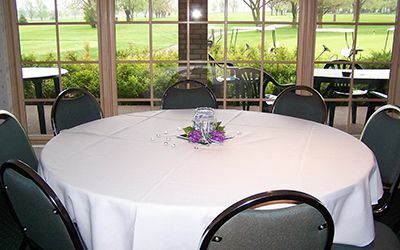 The Terrace Room is our premier reception facility, with the warmth of hardwood floors, round dining tables, large glass windows and doors, and a large outdoor deck overlooking the lush flower beds, wedding Gazebo, and park land. The Terrace Room has adjustable lighting to create that special atmosphere and is completely air-conditioned. The center is completely handicap accessible and has ample parking. Enjoy the flexibility of selecting your own catering service providing you with many more options while adding that personal touch. (P) - A group is penciled in for this date and is offered first right of refusal. A contract has not been signed. Please call 815-758-6663 EXT 7274 to inquire further about penciled dates. 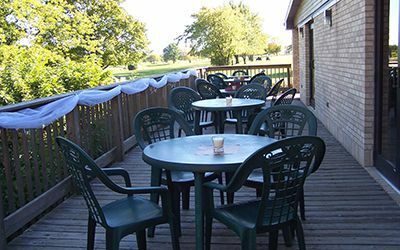 Located at the River Heights Golf Course, the Clubhouse is a great venue for your casual to formal events such as Holiday Parties, Wedding Receptions, Reunions, Corporate meetings, and Banquets. 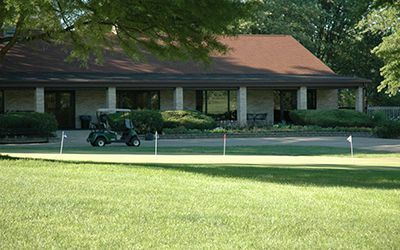 For more information visit the River Heights Golf Course website.